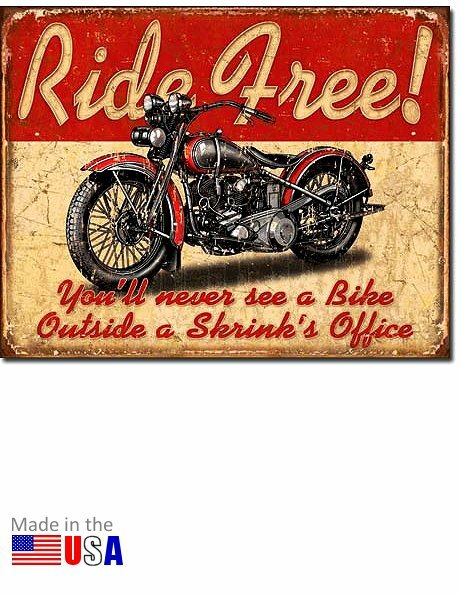 The "Ride Free" tin sign, is the perfect touch for the garage of any motorcycling enthusiast! And it's true... "You'll never see a bike outside a shrink's office." (Unless, of course, the shrink happens to ride one). This is a metal sign, made in the U.S.A. Measures 16 inches wide by 12.5 inches high. UPC: 6-05279-11699-7 | Part No. 1699. Ask a question about "Ride Free" Tin Sign.